The company meetago GmbH, founded in 2004 and based in Bonn, is the developer and operator of the internet portals www.conferencehotel.com and www.conferentiehotels.nl. With more than 2 million business professionals per year and 10,000 corporate customers and businesses of all industries and of all sizes, conferencehotel.com and conferentiehotels.nl in cooperation with tagungshotel.com are ranking among the leading hotel portals on the German and European event market. A competent team made up of 30 employees from the hotel industry, IT and project management, guarantees individual and excellent service and support. The special strength of our team is the implementation of customer requirements. This is how meetago lives up to its name of being a user-friendly system that is highly appreciated by the hotel industry as well as event planners and travel managers. With its system for requests for proposals, meetago offers organisers a perfect online tool for quick and uncomplicated requests for proposals and planning of even more complex events. The exemplary Bid-Management und RFP-Monitoring guarantees a quick transfer of unified, comparable event offers. Event specialists support you with your search for the most suitable hotel alternative if the hotel of your choice is not available. The perfect solution for corporate and business customers is the free integration of the meetago- request tool into the company´s intranet or website with individual adjustment to the desired corporate design and labelling of Preferred Partner Hotels. The unique meetago Bid-Management guarantees a fast and simple processing of all event requests online and within few minutes for all listed hotels and event locations. 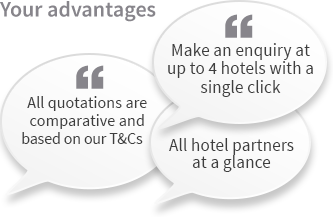 The facts that only 4 hotels can be chosen per RPF and that the hotels receive all relevant contact data for follow-up actions lead to high conversion rates and a quick return on investment.